As the country remembers the 35th anniversary of the Falklands conflict, HCS remembers especially, Major Michael Forge (OH 1954-1957) who was killed in a friendly fire incident in the Falklands at the beginning of June 1982. Michael is commemorated by the School both in our annual remembrance and whenever we use the the "FORGE" MACE. The idea for a mace which would be carried by the Head of School in procession on formal occasions grew from an anonymous benefaction in 1981. Dr. Alan Johansson, a local G.P. and silversmith, was commissioned to make it, and by the time it was completed the Falklands conflict had come and gone. It then seemed appropriate to dedicate it to the memory of Major Michael Forge, O.H., who had died in the Falklands. The basic design of the mace is a square of four shields surmounted by the School motto and a figure of Saint Ethelbert the martyr, patron saint of the Cathedral, taken from a brass originally on the tomb of St. Thomas Cantilupe. The silver work was assayed at the Birmingham office and carries Dr. Johansson's personal mark. The staff is wooden, turned from padouk. Beneath the shields is the inscription "dedicated to the memory of Michael Forge, Major, Royal Signals, O.H., killed in the Falklands, 1982". 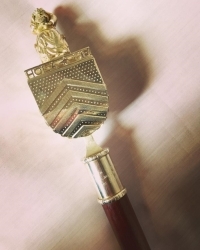 The mace was dedicated by the Lord Bishop of Hereford, the Right Reverend John Eastaugh, at the Commemoration Service on Saturday, 26th March, 1983.